A store can’t make a profit if it isn’t open, can it? On one very special day of the year, however, it may be much more profitable to stay closed. That special day is Thanksgiving, a sacred holiday that unites families and many traditions of this great Promised Land of North America. How is that possible? 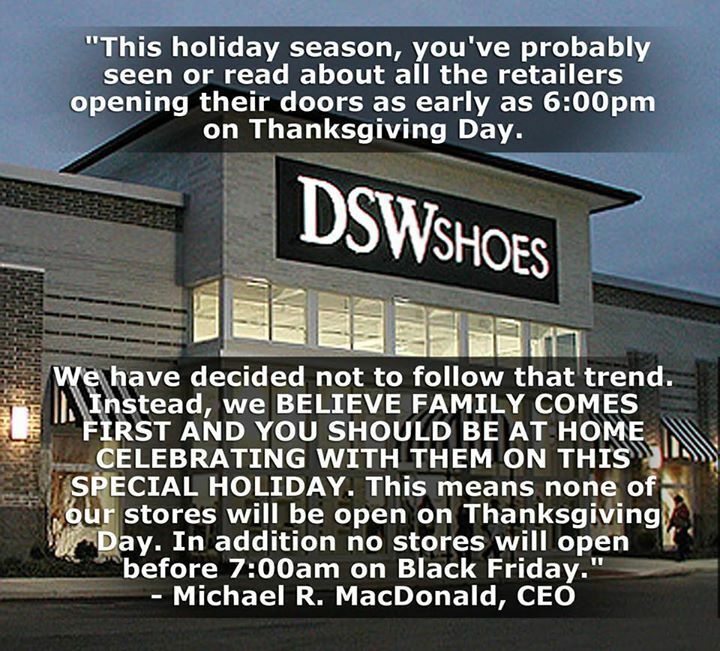 Because the backlash against being open ahead of “Black Friday” is growing and more stores are not just staying closed but announcing their plans proudly. It’s becoming a great selling point that may help them boost sales in the weeks after – and perhaps put an end to the horrible encroachment on Thanksgiving without a single law being passed. But many of the announcements are the same. They are being compiled on a facebook page, Boycott Black Thursday, which I have to say I do not like the name of at all – “Blacker Thursday” might work, but the idea is to support a brighter Thursday lit up with candles flickering through the heavy aroma of a roasting bird. Another facebook page that chronicles the stores that will be closed is Working America, which supports many other causes such as a minimum wage increase. It’s good to see economic justice portrayed by what it really is – support for genuine family values. Which stores will be closed? It’s a long list, recently joined by the TJX family of stores that includes Sierra Trading Post, Marshall’s, HomeGoods, and TJ Maxx. Nordstrom has always been closed on Thanksgiving, as has Dillard’s. REI, American Girl, and Burlington have also confirmed they will be closed. There are many other family retail outlets across the nation that are too numerous to name that will be closed as well. It is unlikely to hurt any of them. A very small portion of shoppers go out on Black Friday, less than 13% last year. And even fewer shop on Thanksgiving. The entire thing is driven by an outdated tendency to measure the strength of the entire holiday season by reporting on one anecdotal day. Since we have better real-time ways of measuring sales, no one puts a lot of stock in how sales went the first day, no matter how it is stretched, other than the legacy media. But with the backlash noted in Time, among other places, it’s clearly a dead point all around. There is a growing perception of a benefit to standing up for your workers by being closed on Thanksgiving and that’s probably worth more than being open a few measly hours for a few people who are, let’s be real here, more than a little crazy to start with. May these blessings be for everyone. Will 2014 be different? This may be the year that being open on Thanksgiving finally became known as offensive, hostile, or just plain tacky. After all, retail responds to consumer demands first and foremost. If the vast majority of consumers who do not shop on Thanksgiving make themselves heard than you know stores will stop paying the big overtime it takes to staff the place for the very tiny rush that takes place. That’s not to say that every single store should remain closed, of course. Travelers who simply have to get back in the evening will always be grateful for that gas station with the lights on and you never know if you might run out of butter at a crucial time. That’s different somehow, and it would be terrible to legislate that everything must be closed. Like many things in our world, we could write laws to outlaw various forms of indecency in complex lawerese, but isn’t it better if people just don’t do them? May 2014 be the year that Thanksgiving was saved once and for all. Saved by the people, for the people. That’s the kind of holiday it’s always been and always should be. And let’s not forget the poem from 2011 on Black Friday. This entry was posted in People & Culture and tagged black friday, decency, families, retail, Thanksgiving, tradition. Bookmark the permalink. I’ll believe the backlash exists when I see it. Two of the anchor stores of the mall I work in have declared they will be opening at 6pm on Thanksgiving Day staying open right through to 9pm on Friday. The lines they had last year when they opened at 8pm apparently convinced them that opening even earlier will net them even more sales. Even if their sales are down to last year they will probably assume they would have been even worse off they hadn’t opened early. That’s terrible news, and I hope that it at least wanes this year. 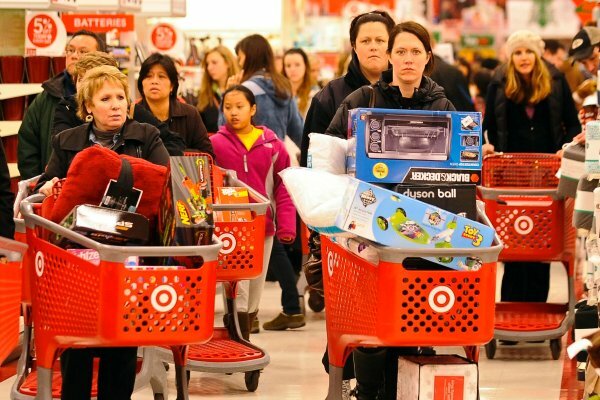 I have no idea who goes out shopping at 8PM on Thanksgiving, but there has to be something better for them to do. It doesn’t seem to me like a backlash is brewing either, but I hope it happens. There is no reason to be open on Thanksgiving. Perhaps we can all support it and help make it happen? I’d be willing to discuss this issue with the Barataria community over a Belgian, Dutch and German beer in a neutral place such as Switzerland or Sweden. In medieval times November would be the month that animals for whom there would be not enough feed would be slaughtered. 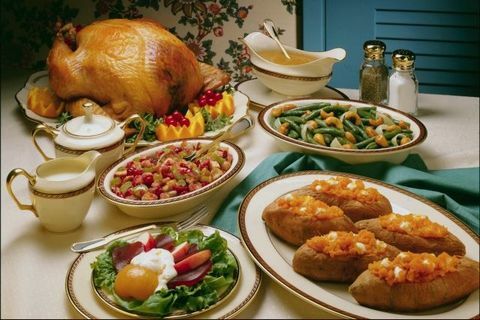 There was an abundance of food as the hard work of harvest had been completed. In the villages holidays were a time for merriment, conviviality, some religion and there would be extra time to court the pretty girl you were interested in. All that sounds better than a mad rush of crazed shoppers. Also, we celebrate Thanksgiving very late, after the harvest, because it’s really about our Constitution. Did this piece last year. People just need to calm down and stop being crazy. Let me know if you’d be interested to write an article for me personally?